The nature of image capture with digital compact cameras means Opticron telescopes can be used as high magnification telephoto lenses for wildlife photography. There are some limitations to this conversion however as viewing eyepieces are not specifically designed for taking photographs with digital cameras. As a result it is often difficult for a viewing eyepiece to project a large enough dia. path of light into the camera lens and onto the CCD within. This results in a partial image being created in the camera and a condition known as vignetting or circular image within the available rectangular image frame. Vignetting can be 'cropped out' of the final image using photo editing software but the final image will be equivalent to using a narrow field eyepiece. Choose a camera with a small lens diameter. The smaller the lens diameter the more of its' surface area will be covered by light exiting from the eyepiece. Commonly camera lenses of diameter less than 20mm give best results and camera lenses over 30mm in diameter will require at least 3x optical zoom to attain a 'full frame' image. Note. In addition to eyepiece magnification and camera lens diameter, variables such as eyepiece eyerelief and field of view plus individual camera zoom-lens mechanisms all play an important role in achieving the best overall 'set-up' for this type of telephotography. There is therefore no substitute for individual testing. Eyepieces As a general rule, the following eyepieces provide the best overall images with a wide range of different compact digital cameras. To help they have been graded according to particular requirement. The 50065 DCC adapter provides a secure direct connection between suitable compact cameras and selected HDF T, HDF an HR eyepieces. The 50064 SDL DCC is a larger version of the DCC designed for the 40935 SDL zoom eyepiece. Suitable cameras are generally those that feature either a 'fixed position' camera lens with integral thread to accept a lens hood thread/tele-converter or a 'variable position' camera lens that is supplied with an optional lens hood or extension tube that covers the lens as it extends and retracts. Step rings needed to connect a hood or tube to the 28mm external thread featured on both versions of the DCC adapter can be obtained separately from specialist accessory suppliers. * 50068 insert only fits in combination with 50067 insert. 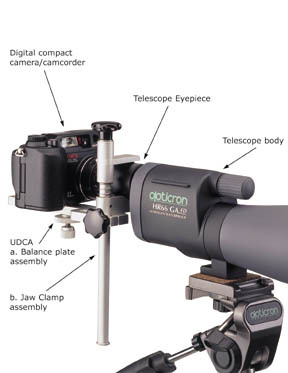 The Universal Digital Camera Adapter is designed to allow you take high magnification photographs using Opticron telescopes and eyepieces in conjunction with most digital compact cameras and some digital camcorders using eyepiece projection.Many digital compact cameras do not have screw threads on the lens assemblies to allow for direct coupling, so the UDCA is designed as a three-way adjustable balance plate that fixes directly to the telescope eyepiece.The camera is fixed onto the UDCA and can be adjusted in three planes to enable correct positioning with respect to the eyepiece. The vertical position of the balance plate can be fixed in order to swing the camera + balance plate in and out of position. This feature allows you to alternate between taking pictures and viewing through the eyepiece in the normal way.Mounting the UDCA requires an eyepiece dia. less than or equal to 56mm and fixed (non rotating) eyepiece tube distance of 15mm.